Palestinians organize solidarity demonstrations as a mass, open-ended hunger strike spreads in Israeli prisons. On the first day of the Freedom and Dignity hunger strike, 1,600 Palestinian prisoners refused food from within 22 Israeli prisons. The hunger strike commenced on Palestinian Prisoner Day, April 17, 2017. The movement demands overarching policy changes, such an end to administrative detention, along with improvements to deteriorating living conditions in Israeli detention centers. The prisoners, according the their leaders and committees, say the hunger strike comes after years of fruitless discussions with the Israeli Prison Service (IPS). The prisoner committees and political parties announced that all prisoners who have not yet joined the strike plan to. Only prisoners who are suffering from critical illnesses will forgo participation. Thus far, the movement is the largest prisoners strike since 2012. In Palestine, tens of thousands of Palestinians met the first day of the Freedom and Dignity hunger strike with energized popular and political action. In the centers of Palestinian cities and towns, people set up solidarity tents to hold activities for the prisoners day and night. Classes were also stopped midday on Monday to allow the students to participate in demonstrations. 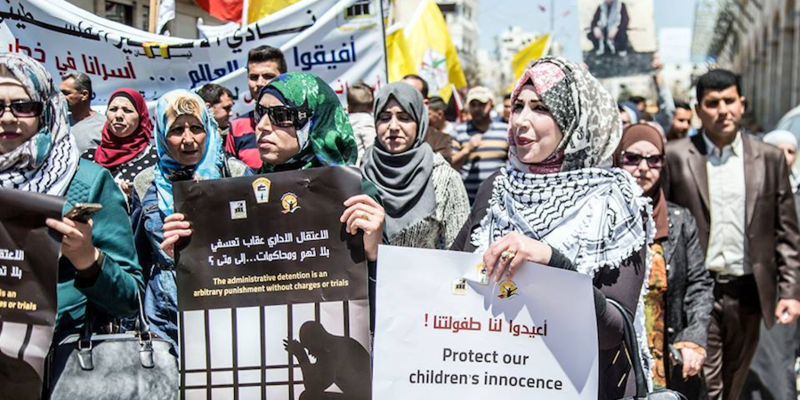 Protests in solidarity with the prisoners occurred in every major city in the West Bank and Gaza. Clashes broke out with Israeli soldiers at a demonstration on Monday at the north entrance of Bethlehem, where many were wounded by rubber bullets and other dozens effected of tear gas. Opposite of Ofer Prison, west of Ramallah, four protestors were also wounded with rubber bullets and another four were arrested. Hundreds of university students went to the prison to demonstrate solidarity with detainees on hunger strike. Israeli public security minister Gilad Erdan affirmed that prison officials will not “negotiate” with the hunger strikers. He also said he has established a “field hospital” at Ktzi’ot prison in the Naqab to transfer hunger strikers to instead of public Israeli hospitals. Some of the doctors there will reportedly be reservists from the Israeli military. The “field hospital” has heightened fears of force-feeding, which the Israeli high court ruled as constitutional last year. Palestinian media reports that IPS has already confiscated TV sets, radios, and even pen and paper from those resisting the conditions of their incarceration. IPS has also suspended family visitation for all detainees refusing food, and it seems in some cases visits from lawyers. Marwan Barghouti, an imprisoned Palestinian legislator in the Fatah party acting as the leader of the strike, was also transferred to solitary confinement. There are 6,500 Palestinian political prisoners – including 400 administrative detainees, 300 hundred children, and 54 women – in Israeli detention centers today. Ahmad Jaradat is the Senior Project Coordinator at the Alternative Information Center.